In his newest poetry collection, Here Comes the Nightdust, multi-linguist poet, fiction writer, translator, editor and artist Marc Vincenz brings us far beyond the Pillars of Hercules. Part travelogue, part love song, part meditative reflection, Vincenz takes us on a profound journey of inner and outer space. These ambitious poems move with equal ease through Icelandic mist and through the crowded backstreets of Uttar Pradesh, under the Arc de Triomphe to commiserate with an aging Postmodernist, climbing rose trellises in Como with a young lover and even into the Kingdom of the “Smallest Common Denominator.” Here Comes the Nightdust traverses a complex webwork of myth and allusion, and yet the language always remains heartfelt and direct. The alluded-to “Nightdust” itself may be an emanation, a unique and magical element that accompanies us to our next destination, toward our next evolution, threading us through the narrowest eye of a needle into the gyre of the creative impulse. Marc Vincenz has always orchestrated his poems into sequences, and Here Comes the Nightdust offers us three. In the poems of “A Deadly Cold” we glimpse scenes from a drama with two players—a man and woman, Hess and Wren—in a word rich in money, crime, and information, but poor in wisdom, community, and insight. Haunted by dreams of a lost primordial wisdom, of redeeming laughter and “tongue-twisting epiphanies” our protagonists inhabit a world growing ever more wintery, but find, in memory and intimacy, a way to keep us “within a hair’s breadth/of affirmation.” The poems gathered as “All that Fruit, Falling” take us from winter to spring, where we see beyond the contradictions of the intellect, the “mathematical symbols, exploratory theorems,” and feel a force that thickens each growing blade of grass, that emboldens our voices to utter a quivering “yes.” The final sequence, “Visible in the Almost” takes Wren and Hess to an unexpected conclusion, and completes what is, in fact, a cycle of sequences: a three-tiered saga of the soul. I can’t think of any poet writing today who has the range of subject matter that Marc Vincenz exhibits in Here Comes the Nightdust. The poems are wise and learned, and yet Vincenz wears his erudition lightly, speaking in a tone that is unmistakably confiding. This is the genius of the collection: navigating the high-wire act between the personal and the abstract, with memorable music, star-studded diction, and an authority I can only describe as intimate. Good poets give us a world. 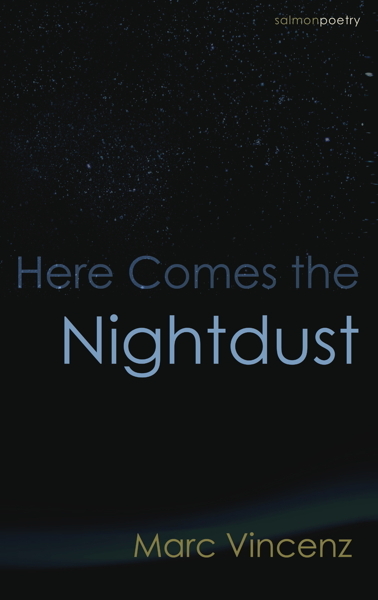 In Here Comes the Nightdust the prolific Marc Vincenz gives us the universe. His latest collection praises and admonishes the human condition as he deems fit, all done with striking language and verve. But what I’m most struck by is Vincenz’ use of the flora and fauna “Every Last Syllable of Grass” to point out how we and our planet are in this together, and showing respect for both is the smart thing to do. He and his creation Wren keep asking the necessary questions whether there are decent answers or not, forays into the mysteries of living “So this is how it begins/with candlelight and hope.” Marc Vincenz continues to demonstrate that gravitas and delight are not mutually exclusive, and that wit “We must supply the world with spaghetti”—and who would disagree with that?—is as necessary as the stars, nightdust and first-rate poetry. A magical meditation, at once earthy and otherworldly, Marc Vincenz’s Here Comes the Nightdust interweaves secrets, nostalgia, memories and dreams. Both mournful song and ode to life, this daringly personal and imaginative collection balances “between despair and delight,” calls upon “that sudden surge of pure astonishment,” and takes the reader on an unforgettable journey. 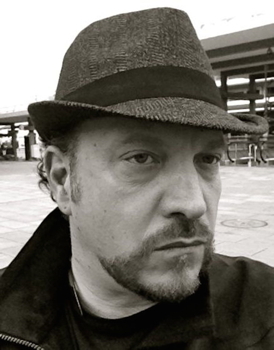 Marc Vincenz is co-editor of Fulcrum and the publisher and editor of MadHat Press. He is the author of fourteen books of poetry, including Becoming the Sound of Bees, The Syndicate of Water & Light, Leaning into the Infinite, and The Form of Time: New and Selected Poems (Copper Coin Press, India). His novella set in ancient China, Three Taos of T’ao, or How to Catch a White Elephant, is shortly to be released by Spuyten Duyvil. He has also been widely published elsewhere, including in The Nation, Ploughshares, The Common, Solstice, Raritan, Notre Dame Review, World Literature Today, Los Angeles Review of Books, New World Writing, et al. Vincenz, who was born in Hong Kong and holds dual British and Swiss nationalities, is a multi-lingual translator of many contemporary German, French and Romanian authors. His latest work of translation, Unexpected Development (White Pine Press, 2018), by prize-winning Swiss novelist, poet and playwright Klaus Merz, was a finalist for the 2105 Cliff Becker Book Prize in Translation. Vincenz has received fellowships and grants from the Swiss Arts Council, the National Endowment for the Arts, the Witter Bynner Foundation for Poetry and the Literary Colloquium Berlin. He lives in Massachusetts.